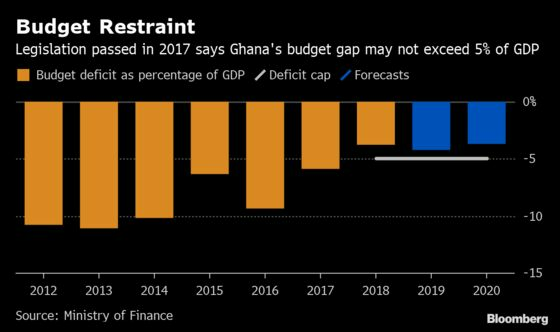 For the 16th time since the 1960s, Ghana is wrapping up a financial bailout from the International Monetary Fund and stepping away from the lender’s oversight. Now, it’s up to one of Africa’s perennial overspenders to show that it can stick to a budget. The previous time Ghana was in this position was in July 2012, five months before general elections, the country recorded the first of three consecutive annual fiscal deficits that exceeded 10 percent of gross domestic product. Its huge debt burden became even more difficult to service when erratic power supplies weighed on growth and sent the currency on a downward spiral, prompting it to turn to the IMF again in 2015. Now, two years after the government of President Nana Akufo-Addo came to power on a pledge to take “Ghana Beyond Aid,” the deficit has narrowed, inflation has slowed, debt levels have stabilized and economic growth is accelerating, estimated at 5.6 percent for last year and 7.6 percent for 2019. Reforms that range from legislation that outlaws large deficits to the establishment of fiscal supervisory councils and an aggressive banking-sector overhaul will do away with the need to ask the IMF for a 17th bailout after it passed the final review of the current one on March 20, according to the government. Ghana’s sale of $3 billion in Eurobonds last month, the country’s biggest yet and oversubscribed more than six times, was proof that investors have faith in its financial management, Finance Minister Ken Ofori-Atta told lawmakers March 28. The government didn’t rein in the wage bill sufficiently, after overruns “by a little value” at the ministries of education and health, said IMF country representative Albert Touna Mama. Ghana missed a target level for net reserves at Dec. 31 after the central bank had to allow the repatriation of securities held by foreign investors. “There are structural reforms such as public-sector efficiency and a reduction in the huge wage bill that Ghana failed to implement,” said Godfred Bokpin, senior finance lecturer at the University of Ghana. “Post-IMF, the key issue would be maintaining the fiscal discipline and doing so across the elections cycle,” said Stuart Culverhouse, London-based chief economist at Exotix Partners LLP. Ghana needs to improve revenue collection to consistently meet its revenue targets, he said.